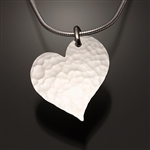 This sterling silver pendant has a beautiful hammered texture outlining the contrasting smooth surface in the middle. The unique shape of this pendant along with the light reflecting qualities of the hammered surface create a stunning piece. This pendant is 3/4" x 1" and comes on a 1mm sterling silver snake chain. 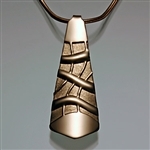 This pendant has an amazingly graceful outline. The movement of the two sympathetic shapes and the contrast in metals makes this pendant truly stunning. The front piece is 14K bi-metal, and the back sheet is brushed sterling silver. It is 3/8” x 1 1/4” and has a 1mm sterling silver snake chain. Please note that the direction of the pendant might be opposite from the picture. This pendant has unique organic forms in pierced sterling, suspended over a sheet of anodized niobium. There are 8 colors of anodized niobium to choose from. There is also a 14K bi-metal back available, this is listed as a separate item. The two sheets in this pendant have graceful swells, creating a slight spherical shape. The depth this creates along with the kinetic movement between the two sheets makes for a truly remarkable piece. This pendant is 5/8” in diameter and comes on a 1mm sterling silver chain. This pendant is a wonderful piece. The top sheet is pierced sterling leaving graceful lines that are suspended over a niobium back piece. These two pieces are puffed in opposite directions, creating a clam-shell like form. This pendant is a 5/8" square and comes on a 1mm sterling silver snake chain. This pendant is also available in a 1" square. It is listed as a separate item, 416L.sn. Embossed soft texture, organic lines, raised cylindrical forms and broad polished areas make this pendant very popular. It has just the right amount of detail to not over power the pendant itself. This piece is 1/2” x 1 1/4” and comes on a 1mm gold filled snake chain.